Whether the markets are up, down, or sideways, you can generate more income and wealth. It’s the doggy-version of county lock-up. Lt. Dan DeSousa, with Animal Services, said dogs kept there are serving a 10-day quarantine for biting. It's not a punishment. It's a precaution to make sure the animal doesn't have rabies. “A lot of the times, dogs are biting out of fear,” DeSousa said. “They’re put in an uncomfortable situation." In recent years, California has seen the most deadly dog bites across the country. Last year, five people were killed, most of them right here in San Diego County, according to national data from the Center for Disease Control. The San Diego County Department of Animal Services, which investigates more than 2,500 reports of dog bites every year, tracks where dangerous dogs live, but the agency doesn’t present that information to the public. The agency also maintains the address of record for dogs that have caused serious bites to humans, which NBC7 Investigates obtained through the California Public Records Act and mapped out. 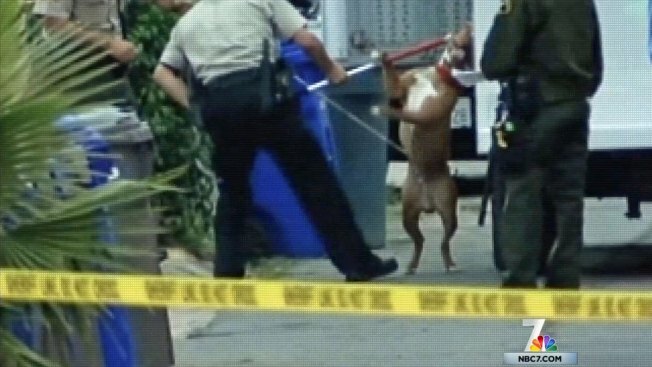 NBC7 Investigates examined data from 7,600 reports of bites between July 2011 and June 2014 in the jurisdiction of Animal Services, which includes the unincorporated portion of the county as well as the cities of San Diego, Carlsbad, Santee, Solana Beach, Del Mar and Encinitas. We found the number of reports of serious injuries from dog bites increased 28 percent between 2012 and 2013. Data from Animal Services shows over the past year, the zip codes including the City Heights and Encanto neighborhoods had the most dog bites in the area, with 94 each. Zip code 92102, which includes the Golden Hill neighborhood had the next most, with 86 bites reported. The zip code which includes the Fallbrook neighborhood had 85. DeSousa said looking at the data, it’s not easy to tell why one area may have more reported dog bites than another. The dogs displayed in the map above are only those who have caused the most serious bites. NBC7 Investigates also examined the reports to see which breed of dogs were biting the most. The Pitbull was the breed with the most bites reported, a total of 851 in a three year period. One hundred of those bites were listed as serious. The German Shepherd had the second most bites reported with 349 bites, followed by the Chihuahua with 333. The reported dog bites range in severity. Some are serious and deadly while others are mere nicks on fingers or hands. “So, realistically, if you have a ball in your hand and the dog comes running up and wants the ball and he accidentally bites you and breaks the skin, by law, by definition, that is a bite,” DeSousa said. Once a dog bites someone the animal has to be quarantined, usually in its home, but sometimes in the back wing of the Animal Service Building on Gaines Street. If these dogs bite anyone again, anytime in the next four years, they'll be classified as a "dangerous dog." Right now, 44 local dogs within Animal Services’ jurisdiction have earned that title. Executive Producer Lynn Walsh and NBC7 Intern Aleksandra Konstantinovic contributed to this story.